Fiscal policy played a critical role in the aftermath of the global economic crisis. 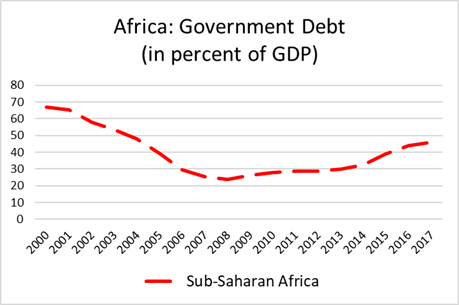 Large countercyclical fiscal stimuli—previously considered a tool that only advanced economies could use—became acceptable in developing economies. 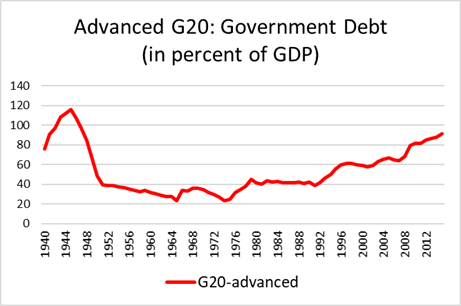 Most governments had only modest fiscal space, but the need to bolster domestic and global demand was considered urgent. The role of fiscal policy has shifted—mostly expanded—in other ways as well. Today, many advocates see fiscal policy as helpful in reversing productivity slowdown, offsetting the effects of demographic trends, reorganizing economic structures, spurring innovation, and achieving stronger and sustainable growth. With a preponderant share of economists in favor of activist fiscal policies, those favoring structural reforms and supply-side policies to address these issues are decidedly in the minority. Even today, 10 years after the crisis, the dominant view is that countries with fiscal space should continue to spend more. The bar has been implicitly lowered because of abundant global liquidity. Even countries with weaker fiscal situations continue to have unprecedented access to foreign borrowing and influential voices advocate taking this avenue—combined with tax increases—to keep running expansionary policies. Are these expansionary policies still needed? We think that accommodative fiscal policy has reached the limit of its usefulness. This is because of three reasons: the nature of the shocks that are affecting the global economy, the surge in government debt and the risks it carries, and the type of problems that economies now face. We believe that governments should revise assessments of potential growth downward, shift fiscal policy to a less accommodative stance, start rebuilding fiscal buffers, and recalibrate the tax and spending mix. When the crisis hit the global economy, using a strong fiscal stimulus to limit the impact of the large negative and temporary shock on incomes and demand was the right policy. It was endorsed by the G-20 and the international community more generally, and implemented broadly. But it is not good policy to maintain an open-ended fiscal stimulus in the face of what are clearly permanent rather than temporary shocks. That also means it should not be used to address supply-side, structural problem. The temporary negative impact to output, productivity, and jobs has been overcome. Models that relied on pre-crisis growth rates to estimate economic potential have been systematically biased upward. But even with projections of swifter growth recoveries, recommendations were often in favor of additional spending. Further growth will depend on dealing with the (permanent) shocks from structural shifts and the failures of governments, firms, and households to internalize the changes. With interest rates still at the lowest levels in decades, the immediate burden on government budgets—especially in advanced economies—is modest. But the ongoing monetary normalization, the projected rise in global interest rates (very likely faster than priced in emerging country assets) and the growing likelihood of exchange rate adjustments amplify the risk of a much heavier burden in developing economies. Past emerging market crises always originated in seemingly benign times, with a sharp uptick in policy rates in advanced economies and unpredictable exchange rate movements leading to huge disruptions. The signs are increasingly ominous. Sources: IMF Fiscal Monitor database. The biggest development problems that countries face today are structural: A relentless advance of technology and the growing difficulty in creating well-paying jobs, the lack of productivity growth despite innovation and its diffusion, the rising concentration of economic activity within sectors and industries, and declining birthrates and aging populations, to name just a few. Relying mainly on fiscal policy to address these changes is simply foolhardy. But besides confusing the nature of the shocks to which governments respond, it promotes two dangerous illusions. The first is that governments can or should cushion all kinds of shocks, rather than allow for the economy to adjust to the permanent new realities. The second is the impression that the policies that matter are largely reactive and generally focused on propping up demand-side rather than ex ante supply-side policies that prepare all economic agents to frontally confront these development challenges. We know that economies that are more flexible respond better to shocks. We know that more flexible economies require more agile governments. But agility is about both speed and alignment. Governments have to start aligning institutions, policies, and programs to changing circumstances. Their first action should be to start turning off the fiscal policy spigot.